Whole Foods Market will open its first store in Newport News at the Marketplace at Tech Center on Nov. 4. 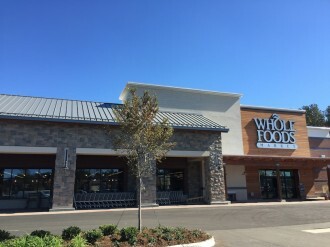 The company will hold a bread-breaking ceremony at 8:45 a.m., and doors will open to the public at 9 a.m.
A grocery retailer of natural and organic foods, Whole Market joins a growing roster of tenants in the 250,000-square-foot retail center. The Newport News store will include the Oyster Point Pub and Raw Bar, with 15 beers on tap (many of them local brews), a bakery with artisan bread, and it plans to feature many local food suppliers. “Whole Foods Market brings a new level of retail to the Peninsula,” John Lawson, CEO of W.M. Jordan, which is a joint venture developer on the project with S. J. Collins, based out of Georgia. Tech Center is located at the corner of Oyster Point Road and Jefferson Avenue. When built out, it will include a 50-acre Tech Center Research Park, the Marketplace at Tech Center and residential offerings on a 100-acre site. The $450 million project is projected to create more than 5,500 new jobs in Newport News.